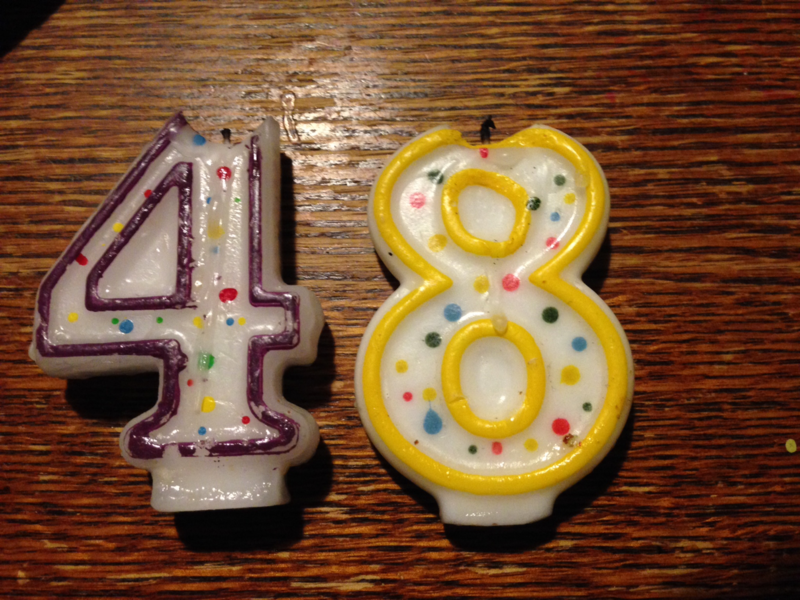 “Welcome to your birthday weekend,” I said to Beth when she came home Friday evening. Her birthday was on Sunday and we had a busy weekend of Thanksgiving preparations and birthday celebration planned. We’re going to Rehoboth for Thanksgiving this year and we’re driving on Thursday to avoid the day-before-Thanksgiving traffic (plus today’s rainy, sleety, snowy kind of winter storm, though we didn’t know about that when we made our plans). So we decided to do as much shopping and cooking ahead of time as we could. Saturday morning while Beth was taking June to gymnastics, I cleaned the kitchen in preparation for cooking. Then shortly after they got back I took June to the Co-op to buy Beth’s new favorite chocolate bar. It was a last minute gift idea. 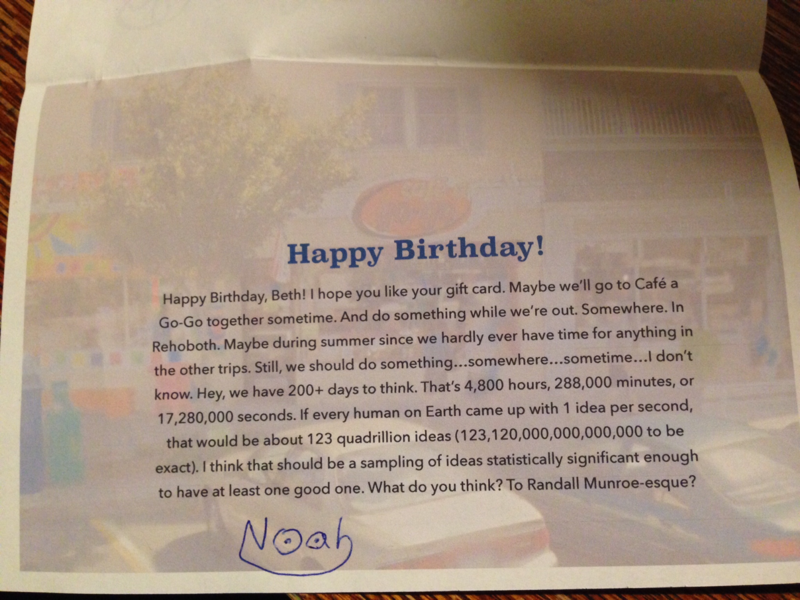 Having bought a gift certificate for Café a Go-Go, Beth’s favorite coffee shop in Rehoboth (from the kids), and three books, which are waiting for her at Browse-About, our favorite book store in Rehoboth (my gift), I thought the presents were all squared away. 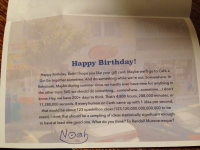 But when June found out Noah had chosen the same gift as her and I’d just combined it into one gift certificate, she insisted on buying something “that’s just from me.” As it was a day before Beth’s birthday, it needed to be something quick. 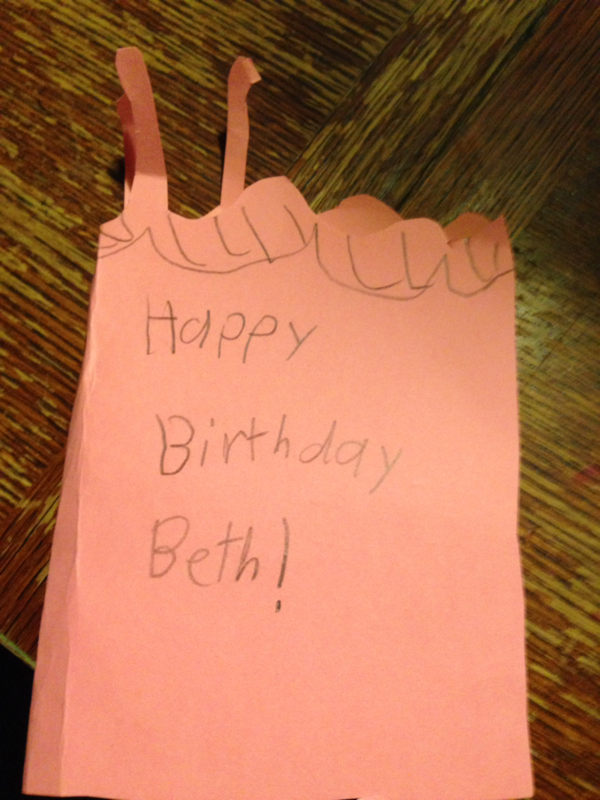 Beth was on grocery run when we got home, so June wrapped the chocolate bar and set to work making a card. She was sleeping over at Talia’s that night so she needed everything ready before she left. After Beth got home, she made mushroom gravy and I made cranberry sauce so the house was smelling nice and festive. Talia’s mom Megan came to pick June up at 3:15. On approaching our house she said to Talia that June must be excited because she was waiting out on the porch. “Not half as excited as I am!” Talia, who was hosting her first sleepover, responded. Megan and I had gone out for lunch earlier in the week and she asked me what were the chances June would get homesick and need to come home mid-sleepover. She’d nixed a sleepover with another girl because apparently that happens to her. “Zero,” I responded. June has been to several slumber parties and slept over at least twice at the other Megan’s house–it’s a confusing fact of our lives that June and I each have a good friend named Megan. She has never once gotten homesick. Beth and I decided to take advantage of June’s absence to go out for dinner and a movie, as an early birthday treat for Beth. We saw St. Vincent, which we both enjoyed, even though it was a little schmaltzy. I like watching Bill Murray in almost anything. We had dinner at Rosa Mexicano, which we also enjoyed despite its inexplicably ungrammatical name. We shared cheese enchiladas and autumn vegetable tacos (with squash and Brussels sprouts). If you go there, I especially recommend the churros with chocolate, caramel, and raspberry dipping sauces. I haven’t been to Spain since my junior year of college, but the thick chocolate sauce seemed pretty close to what I remember. Back home, just as we were getting ready to go to bed, we got a call from Megan (the grown up one). June couldn’t sleep and was homesick and crying and wanted to talk to us. Both Beth and I tried to calm her down, but in the end Beth ended up driving over to pick her up and bring her home. The next day I kept trying to find out what had happened but June would just say, “I don’t know” in a the-incident-is-over-Mommy-why-must-we-continue-to-discuss-it tone of voice. Apparently, at dinner Talia had a shared a story about how her mom got homesick on her first sleepover and had to be picked up and when her friend woke up in the morning, she leapt to the conclusion that Megan had been kidnapped. Hopefully the story was instructive enough that Talia didn’t think the same thing when she woke up to find June gone the next morning. But despite her early exit, June was full of stories about what they’d done. They played Monster Mini Golf and the black light made her white poncho glow, and they’d eaten at a Mexican restaurant where she’d had enchiladas, too. (I was surprised about this until Megan told me she got the sauce on the side and didn’t touch it, so it was really just vegetables rolled up in a tortilla with melted cheese on top). You can watch the tortilla machine make tortillas there and this made quite an impression. Then they watched the Lego Movie, which was very funny and full of jokes that needed to be repeated out of context. So overall, I think she had a pretty good time, even if she didn’t sleep at Talia’s house. Beth and June left to do the main grocery shopping around ten and they were gone until mid-afternoon because they went straight from shopping to ice skate. Noah and I straightened and vacuumed the living and dining rooms and I made a chocolate cake. Then I left to go to the pool and the library shortly after Beth and June got home. When I got home, June and I made coffee frosting and frosted the cake. She wanted to use a recipe from a novel she recently read about a girl witch who only wants to bake and not do magic. (There are forty pages of recipes in the back.) It called for espresso powder, which I thought might be the British way to say instant espresso (the book was British) but I looked it up and found it’s made especially for baking and ground very fine. I didn’t have time to order that online, so we used instant espresso anyway and it turned out fine. For dinner we got takeout Burmese from Mandalay, which is one of Beth’s favorites, and ate the cake, adorned with the numeral four and eight candles we’ve saved and used for years. The four in particular is showing a deep indent from being used for Noah’s and June’s fourth birthdays and all through Beth’s and my forties. Beth noted it will be used next in the spring when Noah turns fourteen. But that will be a story to tell in another birthday blog post.